Noncontact temperature measurement is widely used for industrial process monitoring and control. Infrared (IR) thermal imaging can provide detailed information to help improve product quality and increase productivity. Recent technology innovations, combined with lower cost, make fixed mounted, high resolution IR thermal imaging systems the preferred solution for a variety of process industry applications. The basis for infrared thermal imaging technology is that any object whose temperature is above 0°K radiates IR energy. The amount of radiated energy is a function of the object’s temperature and its relative efficiency of thermal radiation, known as emissivity. Radiated energy can be detected with a thermal camera, and with the use of sophisticated computer software, converted into an image that is visible on a screen. A thermal imaging camera can easily identify hot or cold spots in production line operations by measuring surface temperature variations. Infrared thermal imaging equipment is used in the process industries for a wide range of manufacturing, quality control and asset management tasks. It enables plant operators to adjust process parameters for greater productivity and throughput, find defects on materials non-destructively, and improve their quality control procedures. Infrared thermal imaging systems provide an area temperature measurement as compared to spot sensors, which are only capable of a single-point temperature reading. There are many applications where the desired location to measure the target temperature will vary. In the tobacco industry, for example, IR thermal imaging helps to reduce waste from improperly dried tobacco and prevent fires caused by smouldering tobacco stored in bunkers. A fixed thermal imaging camera and software can also detect unquenched clinkers on coke conveyers, or identify hot spots during pressboard manufacturing and garbage incineration. As IR thermal imaging solutions become easier to integrate into process control applications (thus lowering the total installed cost), more plants are choosing to implement the technology. Within this field, new developments have resulted in shorter response time, while others have taken advantage of faster communications between the camera and the process monitoring/control system. There is also a drive to simplify the user interface, so that infrared imaging becomes as easy to use as machine vision systems. Recent technology advances in infrared thermal imaging allow for an expanded view of process performance. Fixed-mounted process imagers provide a real-time view of thermal images, allowing plant operators to shorten process startup times and lower production line changeover costs. 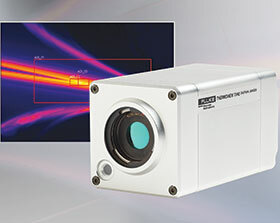 These cameras are paired with intuitive system software, which minimises or eliminates the long learning curve associated with many earlier process imaging systems. The most sophisticated fixed infrared thermal imagers, when integrated with process control and process monitoring software, offer multi-point control flexibility corresponding to areas of interest on the product with independent alarm settings. This provides the ability to reduce heating costs by applying heat to only the areas that need it. Users can also tell immediately when a product changeover is made if their process is under control. Process problems that show up as temperature anomalies are instantly detected and conditions are captured together with images and time date stamps. Modern fixed thermal imaging systems provide easy networking over long distances using a standard Ethernet interface, which transmits multiple frames per second of imaging data from the camera. Additional fibre optic Ethernet accessories eliminate the need to place PC operating system software in a hazardous area. These features reduce the user’s capital investment costs by doing away with the need for specialised enclosures and expensive industrial computers needed to survive in a harsh field environment. In addition, thermal imaging software can be employed for real-time viewing, archiving and playback of both on-line and off-line thermal images. Multiple cameras can be supported simultaneously in a single software package, where upwards of 200 process alarms can be assigned as relay outputs. As a result, users are able to minimise the total system footprint on the factory floor and control room with a single PC installation. Infrared thermal imaging helps industrial plants save money and improve efficiency by optimising process operations based on precise temperature measurements. Fixed IR thermal imaging systems for automated temperature monitoring and control are more affordable and easy to use than ever before. Recent design innovations allow fixed thermal imaging to be used as a cost-effective process control and predictive maintenance solution for many process industry facilities.